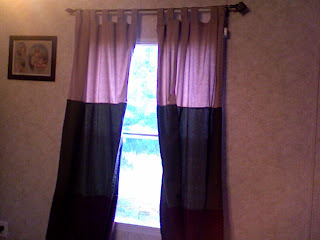 Our curtains are beige at the top, green in the middle and dark chocolate at the bottom. They look great with the furniture. I also removed the blinds. I was tired of them. If I replace them I am going to get those Roman shades. Went out tonight and bought new living room furniture. 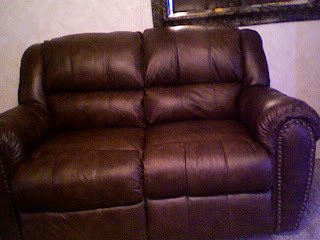 Its leather and a darker shade but it will go nicely up against our light walls. I think its by Lane. 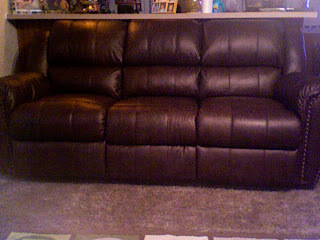 We purchased a couch with two recliners built in, a loveseat with recliners built in and a chair & 1/2 which reclines. We really like the chair. 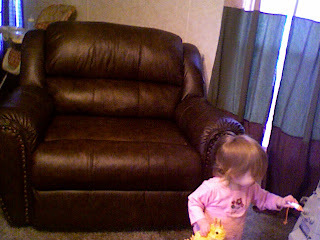 Its big enough for Vance, Jazzy and Riah to all sit in it together. The girls were getting really fussy so before we made our purchase so we left and we went to BWW to eat. It was so good. We had wings, potatoe wedges and french fries. The girls ate and ate and were very good at dinner. We then went back and made our purchase while Ariyah sat in the floor taking a poop in front of everyone with her little legs all stretched out and grunting while Jazzy took the initiative to run around the showroom floor laughing and trying to find a place to hide from us. As we were leaving she thought it would be cute to lay down in the floor face down laughing. Vance bent down to pick her up and she went limp so he grabbed her arm and pulled her up and it happened......... that thing we try to prevent........her elbow popped out of socket .....AGAIN! She started crying and holding her arm all the way out to the car but the last time it happened the ER doctor showed us how to pop it back in place. So, we get to the car and Vance sits her on the trunk and being the great daddy that he is...... popped it back in place and after a little loving from mommy she was fine. We gave her the nerds we had bought for her and she ate the whole box and was competely happy for the rest of the night. We then went to payless and bought her two pairs of shoes which she is so very proud of and wanted to carry her bag around for the rest of the evening. It was a fun day and some very precious memories were made.....once again. Well, monday night Ariyah started running a temp of 103.7. She ran a temp all night and all day on Tuesday. 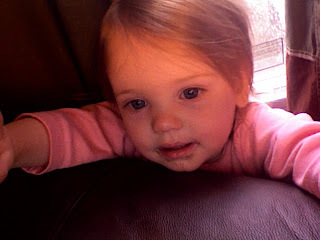 Well Tuesday afternoon when she woke from her nap her temp was 104.7...way too high for me. So, I called Angel (my best friend and nurse at Childrens) she told me to give Ariyah two Tylenol rectal suppositories.... Motrin was not working and She wasn't able to take Tylenol suspension....vomited every time. Well Vance put her in a tub of luke warm water and she SCREAMED the whole time. She was miserable. Her pediatrician finally called me back and even after we got her fever down she was crying uncontrollably so she wanted us to take her to the ER. Its now 900 pm and we are off to the ER with a very sick baby. We get there and the waiting room is PACKED. THe wait if almost 2 hours.....but to my advantage Angel was working ...hehehehe......so she see's us, comes over to ck on Ariyah (we had been there maybe 30 min and just finished being triaged) the next thing I hear over the loud speaker was "Adcock, to the ER".......YAY!!! It was Angel calling us back. She wanted to be the nurse to tend to Ariyah since she knew her so well and I was very thankful that she was. She had to cath Ariyah for a urine sample and we had to do a chest x-ray. Everything came back normal and she was dx with a viral syndrome. I was happy to hear she was ok because it was rather scary there for a few hours. It was positive!!!!!! The one thing I had prayed for all my life and the one thing I feared would never happen for me. It was the best news we had ever received. A baby! Our first baby! Never did I imagine my happiness would turn to tragedy...... I remember going to doctor bleeding and they did an ultrasound to check my status and there it was ......the heartbeat. Such a strong one at that. Everything was great. It was the most beautiful thing I had ever laid my eyes upon. Weeks went by , as we planned and thanked God for such an awesome blessing. Then it happened, that terrible night that I started hurting and bleeding profusely..... we went to the ER......they told me it was probably just a UTI but I knew better in my heart. I held on to that sonogram picture and vance for dear life.....they rolled me back to do another ultrasound and there in the midst of all my fear......a straight line. No heartbeat. I could still see my baby......all curled up in a ball. All I could do was ask "Why God, why did you take my baby?" Nothing made sense, nothing else mattered, my heart was broken and my whole body was numb. I held onto vance and my parents as I tried to understand it all. The next day I had surgery and all of our friends and family were there to cry and hold us and encourage us. That night we went home and everyone came with us.........we have such incredible people in our lives. That day was eye opening for me. I saw how easily life is given and how quickly it is taken away. That has been 3 years ago and since then Jasmine and Ariyah....my beautiful little girls......have made my life so complete. But,My sweet little baby yoda, I love you so very much and I never stop thinking of you. I will see you again one day and until I do........GOD Speed! Ariyah has been sick now for 5 months with URI's, sinusitis, cough, ear infections.....so after what seems like 500 rounds of antibitoics from Amoxicillen to Omnicef to Rocephin Injections....I took her to an ENT today. He said that her ears look great today but one more ear infection and he will do tubes. So now we wait.......... you never know what is the right thing to do. I just pray God keeps her close and takes care of her when I can not. Crazy Beautiful as Vance would say. I love life. I'm very opinionated, , VERY CLEAN, in Love with my family, and devoted to my God.